Rookwood Exchange is located in central Cincinnati at the intersection of I-71 and Smith Road, and adjacent to one of Cincinnati’s premier shopping destinations, Rookwood Commons & Pavilion. Open since 2013, Rookwood Exchange hosts a 120+ room Courtyard by Marriott, featuring the popular C-Bar, Bistro and fire pit patio. 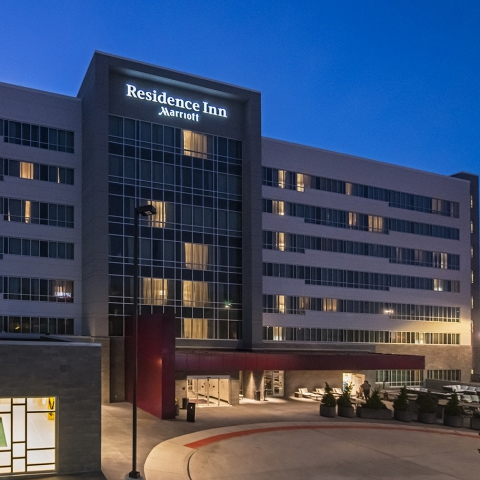 The Residence Inn by Marriott, opened in 2017 and features a Good Eats food truck patio. One Rookwood, midtown Cincinnati’s premier boutique residential address, showcases studio, one and two bedroom apartments offering upscale living, modern amenities, convenient location, and unbeatable surrounding retail and dining options. The Exchange showcases the area’s best collection of dining including Seasons 52, The Capital Grille and Bravo Italian Cucina,, as well as local standouts like Taste of Belgium and Frenchie Fresh. The Rookwood Exchange Office Tower houses 250,000sf of the region’s top business, professional and medical firms, which enjoy building amenities including full workout facilities and locker rooms, a 4th Floor outdoor patio deck, and a fully equipped conference center. Surface parking, Valet Parking, and a 750-Car public parking garage service the entire Rookwood Exchange, while private parking is available for the lodging and residential developments.